Service in CommUNITY is our social action committee which meets on the first Sunday of the month from 12:30 – 2:00 pm. Unity Church in Albany’s Service in CommUNITY Committee is currently committed to working with Albany’s FOCUS churches, working on healing racism, and being involved with the Global Peaceful Cities project. We are in the process of deciding where else we most want to put our time and energy. Some of the organizations that members are already working with include: US Committee for refugees and immigrants, Citizens Climate Lobby, the Regional Food Bank, and the Senior Action Council. We are also looking at becoming involved in other activist groups, such as SURJ (Showing Up for Racial Justice); CAAMI (Capital Area Against Mass Incarceration); ICE–free Capital District (support for undocumented immigrants); A Village Inc., which works in the south end of Albany to empower, educate, and provide services; and Habitat for Humanity. Our first project has been to create “blessing bags” for the homeless. These are bags of essentials to pass out on the street to homeless people or those in need. 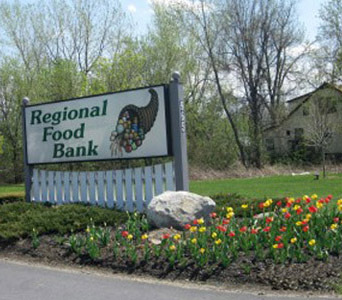 We collect food and household supplies for the Regional Food Bank. The donation basket is displayed in the church lobby. The Food Bank accepts donations of shelf-stable, fresh and frozen food, and non-food items such as paper goods, personal hygiene products and cleaning supplies – basically any item available from a grocery retailer or distributor. During the month of December we “adopt” 2 local families in need, and members of the congregation purchase gifts for them for Christmas, working with Albany County Department of Social Services. We have also begun a summer Adopt-a-Family campaign for a refugee family that the church has chosen to support. As need arises we collect donations for immigrants and refugees, which we then bring to the US Committee for Refugees and Immigrants office. USCRI is dedicated to helping the world’s most vulnerable rebuild their lives. They are part of a nationwide network that breaks through social, cultural, and economic barriers so previously interrupted lives can flourish. We are not currently accepting donations because there are no new refugees or immigrants arriving here at the present. A small group of people at Unity church in Albany recently began meeting one Sunday a month since the end of April to discuss and begin taking action on the long term task of healing racism in Albany and beyond. The impetus for this group was a 2 day conference called Building the Beloved Community: Racism and Beyond held at the First church of Albany, and sponsored by the FOCUS churches of Albany, Friends for Racial Justice, Capital Area Council of Churches, and First Lutheran Church. UCIA was well represented by eleven interested people including our minister, Rev. Crystal, at this event. The presenters, Sister Patty (a person of color) and Sister Ann Louise (who is white) have been doing this training together for a long time and are members of Pax Christi, a Catholic organization started after WW II that is dedicated to furthering peace through social justice. If you are interested in becoming more aware of your own biases, white Privilege or internalized racial oppression and educating yourself more about the history of racism and how it has become institutionalized and systemic in our culture, and what you can do in conjunction with FOCUS programs to further the process of healing racism, contact Dottie Frament (dottie_frament@hotmail.com or leave a message at 518-346-7940). This group meets on the second Sunday of the month from 12:30 to 2:00 pm. Webster defines the word “unity” as “the state of forming a complete and pleasing whole….” At this time in the evolution of the planet and the lives of human beings upon it, the task of “forming a complete and pleasing whole” is the imperative for positive evolution and harmonious existence for all. This perspective has seemingly been lost—our wholeness, our oneness, our same-ness as a human race. We must now remember more than ever, that we have much more in common than that which divides us. The Unity movement stands for and will tirelessly work for harmony so all people may know the freedom of peaceful expression; so they may know their own inner worth and essential contribution to the whole of life. Where there are divisions of opinions, beliefs and perspectives, Unity embraces curiosity, exploration and expanded awareness of the gifts of diversity. Where there is fear of “the other,” Unity stands for inclusivity and peaceful acceptance of another’s right to create the life of his or her choosing. Where there is oppression and hatred, we stand for justice and understanding, and for extending compassion, kindness and forgiveness to restore balance. Where there is discrimination, we stand for inclusivity and equality. 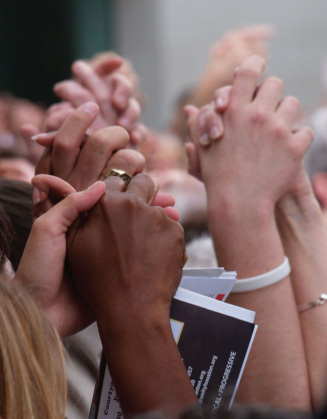 We pledge to be an advocate for the well-being, respect and civil freedom of every human being. Any proposal or action that seeks to discriminate against individuals or classes of individuals based on prejudiced, stereotypic profiles of national origin, class, creed, race, ethnicity, physical ability, sexual orientation or gender identity is in opposition to the core beliefs and values established by our founders. We choose Unity. In harmony with the divine Spirit we stand, so we may live in a spiritually awakened world that is continually evolving. This is our prayer and our decree. Through our actions, we let it be.